The fifth annual Little Black Dress (LBD No. 5) promises to be a night you will not want to miss complete with a runway show and cocktail party benefiting Ronald McDonald House Charities of Mobile. Presented by Mercedes Benz of Mobile, LBD No. 5 features food and drinks from top area chefs and restaurants as well as special appearances by Miss Alabama USA – Jesica Ahlberg, Miss Mississippi USA – Chelsea Reardon, and Ronald McDonald himself. Proceeds benefit Ronald McDonald House Charities of Mobile. To purchase tickets, please visit www.rmhcmobile.org or call 251-694-6873. The fun begins at 6:30 p.m. at Fort Whiting Armory, 1630 S Broad St.
Remington College Mobile Campus is offering complimentary student salon services for local high school students headed to prom. Prom Night Makeover’s goal is to help students look and feel their best at the big dance – all at no cost. The complimentary student salon services will be available on Thursday and Friday. Girls can get updos, manicures, pedicures and makeup; guys can get haircuts. Appointments are recommended and can be made by calling 251-342-4848. Dauphin Island Heritage and Art Gallery offers a acrylic painting class from 1-3 p.m. Class fee is $10 and is limited to 12 people. The lead artist will be Artist Benno Kollegger. For more questions and to register call 251-861-3300. The class will be held at 1008 Alabama Ave. Dauphin Island, Al 36528. Author Roy Hoffman will be signing and discussing his new book Come Landfall at Page & Palette in Fairhope. The discussion will start at 6 p.m. For more information call Page & Palette at 251-928-5295. The festival offers three days of varied artistic experiences and interactive and hands-on activities. The hallmark of Arts Alive! since inception has been it’s multi-dimensional arts platform. Each festival showcases a wide selection of art genres – theater, film, visual, music, dance – all featuring local and regional talent. Arts Alive! takes place in the Cathedral Square Arts District in Downtown Mobile. Festival hours are Friday, 5-9:30 p.m.; Saturday 11- 7 p.m. and Sunday Noon-5 p.m. Admission is free for the entire festival. Kangal Gallery in The Sail Loft will be featuring artist Shelly Smith. There will live music smooth jazz by Jerry Robins. The Artwalk will be 5-9 p.m. at 58 North Royal Street. Special narrated cameo performances for groups and school classes. Bay Shore Ballet Theatre. 9:30 & 11:15 AM. Fairhope Civic Center 161 N Section St, Fairhope For tickets contact Allison at 251-454-6947. St. Jude Memphis to Mobile Run is a relay style run. We begin our run in Memphis on April 9, 2014 and will arrive in Mobile at Moe’s BBQ Downtown at 12:00pm Saturday April 12, 2014. All money raised goes directly to St. Jude Children’s Research Hospital to help find cures for childhood cancers. Please contact us for more information about the run and/or the route. We are always looking for more runners! Contact: Kate Irvine-251-455-3677 or kairvine06@gmail.com for more information. Join Callaghan’s for yappie hour, a dog friendly street party. The fun begins at 3 p.m. and admission for adults is $10 and kids $5 with proceeds going to FOMAS. There will be live music by Julie Anne Sellers and Peek. This is an event you don’t want ot miss. Come support Adoption Rocks at Griffith Shell Station – 1260 Gov’t St. from 11 a.m. till 2 p.m. Various Pro Life Clubs will be pumping gas and washing windows for tips, all donations go towards raising adoption awareness in our community. 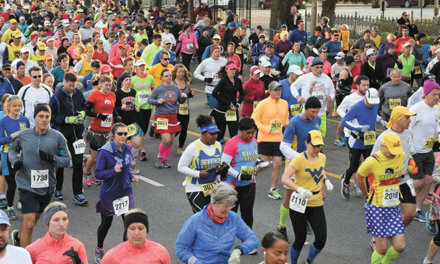 The University of Mobile will host its annual on-campus Ram Run Saturday, April 12. The event will feature a 5k and a 1-mile fun run for all ages. The family-friendly event is designed for all runners, and children are welcome to attend. Medals will be awarded to each age group. Participants will receive tech running T-shirts and refreshments. To register online for the April 12 Ram Run, visit www.umobile.edu/ramrun. Fees range from $10 to $25, with discounts for pre-registration, students and UMobile alumni. For more information, call 251-442-2917. South Alabama Mountain Bike Association is doing a clean up in Chickasabogue Park-60 Aldock Road, Eight Mile, Al 36613. The clean up will be from 9 a.m.-12 p.m. with a ride and BBQ following. Close-toed shoes are required and helmets if you ride. Bellingrath Gardens will host their annual Easter Egg Hunt on The Great Lawn. Thousands of Easter Eggs will be all over The Great Lawn for children to discover. Children may participate in one of three Egg Hunts, depending on age. he Easter Egg Hunt is opened to the public. Admission is free for members of the Friends of Bellingrath. Regular Gardens admission of $12.50 for adults and $7.00 for children ages 5-12 will be charged. Children under the age of 5 are always admitted free. Registration starts at 9 a.m.
Bellingrath Gardens will be hosting breakfast with the Easter Bunny in the Magnolia Café. The Cafe staff will be prepare and serve pancakes, Sausage Patties, and fruit. Breakfast is $8 for adults and $5 for children 12 and under. Reservations are encouraged. Guests that attend the breakfast will have priority for photos with the Easter Bunny. Call 251-973-2217 for reservations. Atlas Fights debuts in Mobile, Alabama at Convention Center with “Battle on Mobile Bay”. Tickets on sale now. This is a new beginning of sorts in Mobile for Mixed Martial Arts (MMA) cage fighting as they have not had any Live MMA cage fighting events in the area in over five years. This is the first ever Atlas Fights event in Mobile. Fun and Educational for the whole family! Explore our laboratories and meet Marine Scientists to learn about their research and projects. Enjoy lots of marine and environmental hands on exhibits, games and activities. Free child’s admission to the Estuarium, the Dauphin Island Sea Lab’s public aquarium. Food available for purchase. Dauphin Island Sea Lab, 101 Bienville Blvd., 251-861-2141 for more information. Blind since birth and the Van Cliburn Gold Medal WInner, pianist Nobuyuki Tsujii joins the Mobile Symphony for a celebration of Russian music at The Saenger Theater. This concert will certainly satisfy those who were begging for more! Tickets are on sale now. Visit mobilesaenger.com for more information and tickets. Fox News Channel star and author Greg Gutfeld will be signing his new book Not Cool at Page & Palette, starting at 7 p.m. For more information call Page & Palette at 251-928-5295. Southern author and blogger Robin O’Bryant will be at Page & Palette signing her new book Ketchup Is A Vegetable and Other Lies Moms Tell Themselves. The signing will start at 1 p.m. For more information call Page & Palette at 251-928-5295. Learn how to search using various data bases provided by the Mobile Public Library and other organizations; in partnership with the Church of Jesus Christ of Latter-day Saints. The Meeting starts at 6:30 p.m. at the Mobile Public Library, Moorer/ Spring Hill Branch. Umphrey’s McGee is an American progressive rock band originally from South Bend, Indiana, whose music is often referred to as “progressive improvisation”, or “improg” and they are going to the Saeger Theater. UM experiments with many genres including funk, jazz, blues, metal, electronic, bluegrass, and folk. The show starts at 8 p.m. and tickets are on sale now. Spring is here and what better way to enjoy the nice weather than lunch in Bienville Square. There will be live music and tables set up to make your lunch more enjoyable each Wednesday in the Spring from 11:30 a.m. till 1:30 p.m. You can bring your lunch or stop in at your favorite Bienville Square eateries and ask for the Brown Bag special.